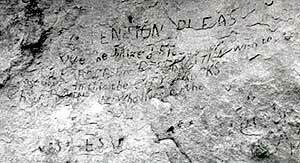 Writing by pioneers at Register Rock along the Oregon Trail in the City of Rocks, (September, 1987). The California Trail left the Oregon Trail and the Snake River west of the mouth of Raft River and headed south and west toward the Nevada desert. It was joined by the Hudspeth Cutoff near the town of Malta, on the west side of the Raft River Valley, and the two wound up Connor Creek and south to the Silent City of Rocks. There, a cutoff from Salt Lake City joined them, and a single trail led westward over Granite Pass at the south end of Middle Mountain toward the Humboldt river drainage. A recurring story in the City of Rocks area is of the Almo Massacre, in which 300 Pioneers on the California Trail were said to have been massacred by Indians in 1861. All their stock and belongings were allegedly taken and nothing was left. The bodies are said to have been buried in dry wells, and have never been found. This fable has no basis in fact, was never reported in a newspaper account, nor does it appear in any Pioneer diary (madsen, 1990). It is in the category of folklore, since it is a story that keeps surfacing. As such it must be culturally useful to those who hear and repeat it. The Albion Range, including Mt. Harrison, Cache Peak, and the Silent City of Rocks exposes a "Cordilleran metamorphic core complex," one of several that extend from the Tucson, Arizona area north to northeastern Washington. The Silent City of Rocks is an Idaho treasure. The mysterious fins and monoliths eroded from the 30 million years old Almo Granite are perfect for rock climbing. A walk along the South Fork of Circle Creek when the aspens are golden is an unforgettable tour. (left) Aerial view of the City of Rocks, looking northwest at the junction of the Oakley Road and the road south to Twin Sisters. Register Rock is immediately below the intersection. Other named rocks include Bath Rock, south of the Oakley Road near the summit. The creek draining the Silent City of Rocks is Circle Creek, (September, 1988). (center) Twin Sisters and the California Trail, looking west. The arcuate western contact of the Oligocene granite of the Silent City of Rocks pluton follows the edge of the granite monolith. West Twin Sister is the only rock made of Archean gneiss. The California Trail route can be seen in the foreground, slanting across the view. It passed behind the large light colored rock at the base of the view, (august, 1986). (right) Geologic cross section, west to east across the Albion Range City of Rocks area. Geologic units are as follows: Nv = Neogene volcanic rocks; Tg = Tertiary granite (Oligocene City of Rocks pluton); Z-Pz = Late Proterozoic and Paleozoic sedimentary rocks; Xe = Middle Proterozoic Elba Quartzite; Wgc = Archean Green Creek Complex (gneiss and schist). For more information see Miller and others (1983), Saltzer and Hodges (1988) and Bandy (1992). Click on image for a larger view. The upper part of the Albion Mountains is underlain by Paleozoic and Late Proterozoic metamorphic and sedimentary rocks, in places spectacularly folded, as along the road to the summit of Mount Harrison. The quartzites on the summit are structurally overturned. Below these is the green, micaceous Early Proterozoic Elba Quartzite, which can be seen in outcrops along the road below the Pomerelle ski area. South of Oakley thin-bedded micaceous quartzites including the Elba are quarried for decorative "Oakley stone," which is shipped throughout the United States and overseas. Under the Elba Quartzite is Archean gneiss and granite of the Green Creek Complex, exposed where the Mount Harrison road turns off Highway 22. The Twin Sisters, looking north from the California Trail as it leaves the Silent City of Rocks, (October, 1992). The contact between the sedimentary rocks and the gneissic basement is a ductile fault or mylonite zone, the Middle Mountain Shear zone, produced during rapid uplift and stretching of the earth's crust from about 40 to 10 million years ago. The bedrock in the Silent City of Rocks is an Oligocene granite pluton which cooled about 30 million years ago. The granite intrudes gneiss of the Green Creek Complex. The City of Rocks pluton is the youngest granitic body in Idaho. The rock is coarse-grained and unfoliated. It weathers into characteristic rounded monoliths and elongate fins controlled by systems of joints produced by unloading during uplift. On the south edge of the City of Rocks, at the Twin Sisters, called the Sentinels or the Citadels by immigrants, just north of the California Trail, the contact between the 2400 million year Archean Green Creek Complex (South Sister) and the 30 million year Oligocene City of Rocks Granite (North Sister) can be seen. A unique type of Oakley stone is the green micaceous quartzite seen on the front of many 20th century buildings in southern Idaho and northern Utah. The green color of this "Elba Quartzite" is given by a Chromium-bearing mica, fuchsite.